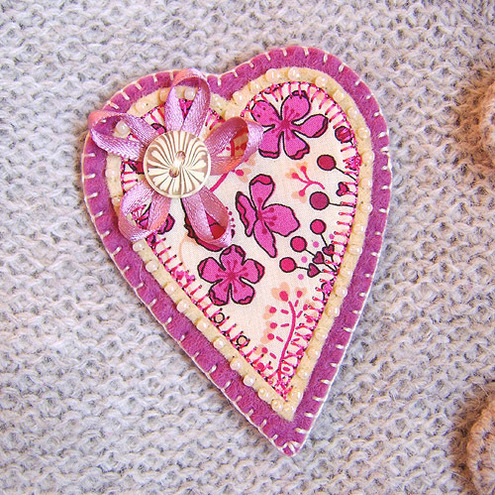 Folksy :: Buy "Fabric Heart Brooch"
A pretty handmade brooch featuring a heart design in Liberty print fabric appliqued onto a felt base. Edged with pretty cream beads and finished with a lovely ribbon and button flower detail. Folksy :: Buy "felt and fabric heart brooch"
Folksy :: Buy "Green & White Fabric Kanzashi Flower Brooch"
Folksy :: "Fabric Heart Brooch"
Folksy : "Fabric Heart Brooch"
Folksy "Love Bird Fabric Brooch"